The inauguration of a peace and reconciliation committee of the Peoples Democratic Party (PDP), scheduled for last Tuesday, failed to hold, as governors elected on the ticket of the party backed out of the arrangement. ADEBIYI ADEDAPO chronicles the development. Irrespective of the intense power tussle within the ranks of the Peoples Democratic Party (PDP), all interests in the former ruling party recently agreed on political reconciliation as the sole solution to the party’s leadership crisis. Factional leaders of the party, Ahmed Makarfi and Ali Modu Sheriff had expressed readiness to have a common ground and resolve the crisis instead of laying claims to various court orders as prove of the party’s leadership. Both factions disclosed their intention to embark on extensive consultations with their respective loyalists to fashion out a way to cement the new unity after about four months of bitter rivalry. The PDP expanded caucus, which met a few weeks ago, also endorsed the peace move. The meeting was attended by Chairman of PDP Governors’ Forum, Olusegun Mimiko, the Taraba State governor, Darius Ishyaku as well as members of the Board of Trustees, the National Assembly caucus and states chairmen. However, hopes were dashed last Tuesday, when the scheduled inauguration of the 28-man reconciliation committee was aborted for undisclosed reasons. Although, details of why the meeting was put-off are still sketchy, there were indications that the Sheriff’s faction and the PDP governors frustrated the peace deal, over some unresolved questions. Apparently weary of his interest and that of his supporters, Sheriff and his loyalists laid the foundation to frustrate the reconciliation move. Controversy started when the factional leader, Sheriff rejected the choice of Shehu Musa Yar’Adua Centre as the venue for the inauguration of the reconciliation committee, but chose a preferred venue at Transcorp Hilton Hotel. The Makarfi’s faction reluctantly agreed to Sheriff’s choice of venue, but demanded that the Borno state born politician should pay for the venue, which he also rejected. Optimists didn’t expect the issue of venue to truncate the much awaited inauguration process, until, when some PDP states chairmen and other party stalwarts arrived the venue, only to discover that no meeting room was booked for the event. Also, members from the Ali-modu Sheriff’s camp were as well not sighted at the venue. Media Adviser to Sheriff Hon Inuwa Bwala, confirmed that members of his camp would not attend the inauguration, as he said that the group was still studying the terms of reference of the reconciliation committee. But beyond the issue of venue, Sheriff might have tactically discouraged the peace deal in order to avoid negotiation on the Ondo governorship tussle. In the same vein, the governors were not favorably disposed to the reconciliation process due to some sensitive political interests. Specifically, the governors were not comfortable with Sheriff’s stands on the parallel gubernatorial candidates for the November 26 Ondo state governorship election. 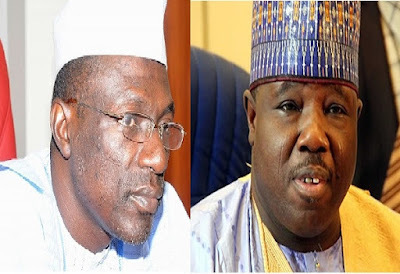 A federal high court sitting in Abuja had ordered the Independent National Electoral Commission (INEC) to recognise the Jimoh Ibrahim of the Ali Modu Sheriff’s faction as the authentic PDP candidate for the election as against Eyitayo Jegede of the Ahmed Markarfi’s faction backed by the PDP governors. The governors also expressed reservations over reconciliation with Sheriff following his insistence to inaugurate a parallel party executive for Delta State, despite existence of a substantive party executive. The governors however cited Sheriffs refusal to submit the list of his 14 members to form the 28 members peace reconciliation committee ahead of the inauguration, as an impediment, thereby boycott the planned inauguration. The logjam was not unexpected as some governors within the party has expressed divergent views on the issue of reconciliation. While some are of the opinion that reconciliation was a step in the right direction, others feel the move will jeopardise very important political interest. Ekiti state Governor, Ayodele Fayose who reserves a considerable level of influence on the group of governors rejected the idea. Fayose stated that reconciliation would only be achievable when the Court of Appeal have resolved the party’s leadership crisis. He added that PDP state governors had not been briefed on the reconciliatory moves. But the Governor of Abia state, Okezie Ikpeazu, noted that the reconciliation move would be a victory for the party and Nigeria at the end. Ikpeazu who deemphasised the role of PDP state governors in the resolution of the crisis, said: “The important thing is Nigeria and the important thing is democracy. Whether you are a BoT member or a party person, it doesn’t really matter. PDP Governors Forum is not political party. Contrary to Ikpeazu’s claim, the PDP governors as a bloc had in the past weighed so much power in deciding a direction for the party. Its influence also increased tremendously as the governors almost assumed the responsibility of the party’s Board of Trustees, after the party lost the 2015 presidential election. These governors orchestrated emergence of Sheriff as acting National Chairman in a rather controversial circumstance. But when Sheriff’s ambition grew beyond their interest, relationship went sour and they have at different times plotted but failed to out the monster the created for themselves. Sheriff upon his emergence as acting national chairman accused PDP governors, particularly Fayose and his Rivers state counterpart, Nyesom WIke of an attempt to hijack the party by installing a stooge a National Chairman. “We will not let PDP to be hijacked by a few people like Governor Fayose and the governor of Rivers State. They have a script that they want someone to act, but I am a man of principle. This is not about Ali Sheriff; it is about democracy, and the rule of law. I never asked to be chairman of the PDP. I was asked to come and assist the party. I never wanted to be chairman of the PDP. I was sitting down in my house when leaders of the party begged me to come and help the party. Initially, I said no, but I later accepted,” Sheriff stated. The governors also schemed-in the Ahmed Markarfi caretaker committee as a fall-out of the botched Port Harcourt convention in May. To this end, the governors exercises a high level of influence of the caretaker committee. Therefore, any reconciliation plan, not supported by the governors is an exercise in futility, since the governors as are still fighting tooth and nail to maintain their grip on the party. This is the real situation as played out on Tuesday when inauguration of the reconciliation committee was scheduled for 4.00 p.m. at Transcorp Hotel, while the governors scheduled their meeting for 2.00 p.m. at Ondo State Governor’s Lodge, Abuja. Shortly after the meeting, news filtered in that the PDP governors are opposed to the reconciliation process. The news confirmed Fayose’s earlier position on the matter. Evidently, the leadership crisis rocking the PDP is far from resolution if the governors still act as the alpha and omega of the party.